We illustrate the CPS model using hexagons, where each hex is one process stage. Because the process is organic - how it is used depends on the situation at hand, this illustration should be understood as a model - that is, as a typical use of CPS - but not as a full-time reality. Here's a quick description of the process, as illustrated. Someone will facilitate the process, making process-related decisions, an oversight function that is used throughout the process. The first stage is to imagine the future state that is wanted, in statements that begin with "I wish...," "I want...," "I will...," or "It would be great if...." Once a vision is decided upon, we find the questions that must be answered (or, problems that need to be solved) in order for the imagined future to come true. These questions will begin with "How to...," "How might...," "In what ways might...," and "What might be all the...." Once we select a question we will work on, we generate ideas that will answer the question. Ideas tend to be rough notions - that is, not implementable solutions - so we select the best ideas and use them to craft solutions. We explore acceptance for our solutions, so that we will know who will assist and who will resist, and what to do about it. Finally, we plan for action,which takes us to the doorway of implementation: creating the future we imagined at the beginning of the process. The word "creative" in the title refers to the results you seek: novel and useful solutions, not just tried and true and traditional ones. But is CPS itself creative? Well, while it is no longer novel per se - it has been is use since the 1950s - it is novel when compared to other problem-solving models. On the surface, CPS looks similar, but what is novel about CPS is this: CPS uses both divergent and convergent thinking at every stage of the process. Most other processes reserve the divergent thinking for the generating ideas stage, but use it nowhere else. CPS multiplies the power of divergent thinking by making it part of the entire process. First, let's consider problems and opportunities. CPS is a great choice if you want new thinking, new ideas, new solutions. It's a great choice if you find you are stuck, if you can't solve a certain problem (or problems), even if - especially if - you're not sure what the problem is. CPS is a great choice if you are missing opportunities, or if you want to take advantage of the opportunities before you. Second, let's consider leadership. Creative thinking and innovative vision are core leadership competencies. CPS provides a structured way for leaders to harness creative thinking, to lead the way to breakthrough innovations, to envision desired future states, and to determine how to get there. Discover it. 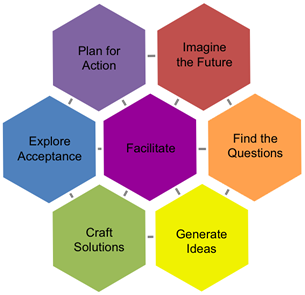 Right here, you can uncover the basics of Creative Problem Solving and CPS facilitation. Click the model above, or click here to get started. Experience it. OmniSkills can facilitate the CPS process in your organization. Have a problem, situation, issue, or opportunity that's ready for new thinking? Let us show you how the process can work for you. Learn about facilitation of CPS here. Learn it. We can teach your people how to use, and how to facilitate, CPS. Because once you've used it, you won't want to be without it. See a course outline here. Download it. We have free quick reference guides and worksheets, which you can download right here.